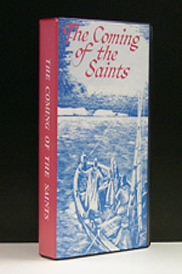 The Coming Of The Saints (VHS - VIDEO) (Also available on PAL (VHS) or [DVD - U.
Retells on video the story of the book of the same title by professor John Taylor of the fate of the disciples of Christ after the resurrection. In this video history and tradition combine to give us a picture of the earliest missionaries of the Christian Faith to the southern part of France. It depicts their selfless devotion their achievements and in some cases their martyrdom for the sake of the Faith of Christ. We find the names of well known characters from the New Testament the three Maries Martha Lazarus Zaccheus and others who sowed the seeds of the Gospel to the peoples of Provence and elsewhere. VHS - Video (48 Min.) ...Standard VHS....ALSO Available on PAL (VHS) for our European customers....please add the letters "PAL" in the comment box when ordering for this special VHS tape.